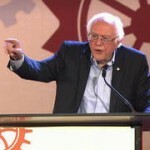 Vermont Senator Bernie Sanders is slated to introduce universal healthcare legislation today, aimed at expanding Medicare coverage to include every American. In a New York Times op-ed published today, Sanders wrote, “This is a pivotal moment in American history. Do we, as a nation, join the rest of the industrialized world and guarantee comprehensive health care to every person as a human right? Or do we maintain a system that is enormously expensive, wasteful and bureaucratic, and is designed to maximize profits for big insurance companies, the pharmaceutical industry, Wall Street and medical equipment suppliers?” Fifteen senators have already signed on as co-sponsors. The introduction of the Medicare for All Act comes after Republicans repeatedly failed to push through their legislation to repeal and replace the Affordable Care Act. The Republicans’ efforts sparked sustained grassroots protests, led by disability activists and healthcare professionals. Donald Trump’s so-called election integrity commission held its second meeting on Tuesday in Manchester, New Hampshire, even as it faces a series of lawsuits and calls for the resignation of its vice chair, Kansas Secretary of State Kris Kobach. President Trump convened the commission to look into his allegations of voter fraud during the 2016 presidential election. But many voting rights advocates worry that the commission aims to lay the groundwork for a nationwide voter suppression effort. At Tuesday’s contentious meeting, the witness list was comprised of 100 percent white men, including the far-right pro-gun activist John Lott Jr., who proposed requiring voters to first pass a background check. As the nation marks the 16th anniversary of the September 11 attacks, questions still swirl about the role of Saudi Arabia in the attacks. The 9/11 attack was carried out by 19 hijackers, 15 of whom were from Saudi Arabia. Sixteen years after the attacks, 9/11 families and survivors are continuing their efforts to take Saudi Arabia to trial. Just this week, the New York Post reported new evidence presented in the case alleging the Saudi Embassy in Washington, D.C., funded a “dry run” of 9/11 two years before the attacks. The families’ lawyers say the new allegations offer “a pattern of both financial and operational support” by the Saudi government.